Peter hooked his monster ulua while using one of his oldest rod and reel combos, an 11-foot 6-inch Sabre pole and Penn 6/0 reel. He'd spooled the Penn with 100-lb test PowerPro and topped it with 80-lb test Ande monofilament. He'd downsized his hook on this rig and baited it with puhi in hopes of catching a small trevally. 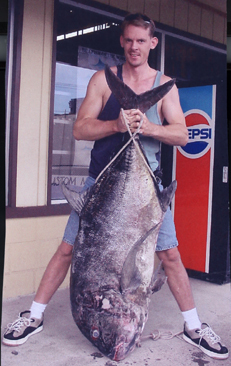 Incidentally, Peter was recovering from an operation and wasn't supposed to lift anything heavier than 5 lbs at the time of his big catch.